Accredited holistic health college launches Integrative Health and Fitness Training certificate preparing students for the International Society of Sports Nutrition and NASM Certified Personal Trainer exams. PORTLAND, Ore., August 2, 2017	(Newswire.com) - ​​​​The American College of Healthcare Sciences (ACHS) announces a new Certificate in Integrative Health and Fitness Training available to current and prospective students beginning in the Fall 2017 term (beginning Sept. 6, 2017). The certificate program prepares students to work in the fitness industry — including athletic clubs, ski resorts, and sports medicine facilities — and to sit for the International Society of Sports Nutrition exam (leading to the Certified Sports Nutritionist credential) and NASM Certified Personal Trainer exam (CPR/AED certification also required). "As an exercise physiologist and former Olympic athlete, I believe this program will prepare outstanding health and fitness professionals," says ACHS Professor Santiago Lorenzo, Ph.D. "This growing industry needs professionals with a holistic approach to fitness. I believe the Certificate in Integrative Health and Fitness Training program offered at ACHS is an excellent opportunity for those interested in working in the fitness industry." ACHS's Integrative Health and Fitness Training certificate is a six-course, 16-credit program that can be completed in as little as two terms full time or three terms part time. Required courses feature a combination of integrative health, holistic nutrition, personal fitness, and wellness coaching, including: CAM 100 Principles & Practices of Integrative Health; NUT 101 Introduction to Nutrition OR NAT 308 Holistic Nutrition; NUT 304 Sports Nutrition; PFT 101 Personal Fitness Training; HLTH 101 Personal & Community Health; and NAT 305 Wellness Coaching & Communication Skills Online. As an exercise physiologist and former Olympic athlete, I believe this program will prepare outstanding health and fitness professionals. This growing industry needs professionals with a holistic approach to fitness. I believe the Certificate in Integrative Health and Fitness Training program offered at ACHS is an excellent opportunity for those interested in working in the fitness industry. 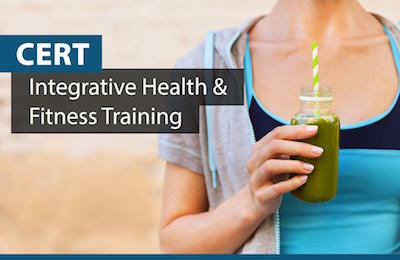 Graduates of the Certificate in Integrative Health and Fitness Training will learn best practices in accordance with professional codes of ethics such as how to create appropriate, individual fitness and nutrition programs; how to establish trainer-client relationships; and how to promote their services. Learn more on the ACHS website at achs.edu/program/certificate-integrative-health-fitness-training or contact an Admissions Advisor at 800.487.8839 or email admissions@achs.edu. For more information about this press release, contact Lauren Shapiro at publicrelations@achs.edu. Founded in 1978, ACHS is an accredited college offering online, on-campus, and study abroad integrative health education. With undergraduate and graduate degrees, diplomas, certificates, and continuing education courses in integrative medicine, ACHS makes holistic health and wellness education accessible to a diverse community of learners, including healthcare professionals, military students, stay-at-home parents, and lifelong learners. Specializations include aromatherapy, herbal medicine, holistic nutrition, and wellness. A Certified B Corporation® and 2017 When Work Works award winner, ACHS is also accredited by the Distance Education Accrediting Commission (DEAC), which is recognized by the U.S. Department of Education and by the Council for Higher Education Accreditation (CHEA). Visit achs.edu. Accredited, online holistic health degrees and career training: aromatherapy, holistic nutrition, wellness consulting, and herbal medicine! ACHS announces two new, fully online bachelor degree programs in holistic health enrolling for the spring 2018 term (starting January 8th) — Bachelor of Science in Holistic Nutrition and Bachelor of Science in Integrative Health Sciences. American College of Healthcare Sciences (ACHS.edu) announced today that it has earned the 2017-2018 Military Friendly(R) School designation for the ninth year in a row and the Bronze Award for Non-Traditional Schools. American College of Healthcare Sciences (ACHS) has been awarded a 2017 Top Workplaces honor by The Oregonian.